There are plenty of reasons why you probably haven’t hooped in the Under Armour Charge Volt Low before. The first is, well, they’re not in stores anywhere. Under Armour didn’t get these to major retailers (at least not that I’ve seen) thus keeping the shoe largely out of the public eye. 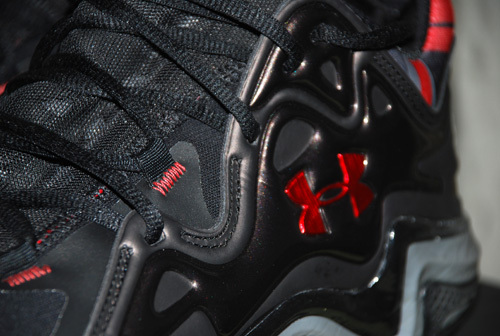 Besides that, any promotional material UA did on a major scale revolved around the Anatomix Spawn – and even that shoe barely registered with consumers. But, I was curious about the Charge Volt Low for a couple of reasons. I was primarily interested in the construction of the shoe, built with a HeatGear one-piece, bootie-like upper with a synthetic overlay wrapping roughly 3/4 of your foot. (The mid top version, by the way, is even more unique with a tall lace-up sleeve in sort of a slimmed down version of last year’s Charge BB disaster.) 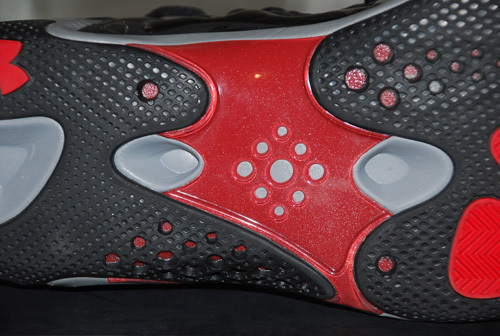 I also wanted to see how the shoe played underfoot with a familiar Micro G midsole, wider base, and large TPU shank – very similar tooling to the Charge BB. With promotion absent and almost no on-court presence, the Charge Volt Low went under the radar. Our job at TGRR is to review as many shoes as we can regardless of how popular they may be, so I’m excited to present a shoe you may not have seen or played in. I mentioned before that the shoe has a fairly wide base, so it’s a solid option for those of you that need more room in the midfoot/toebox area. Despite my narrow foot, I still felt comfortable with the fit of the upper because of the HeatGear bootie that adapts to most foot sizes. If you’ve tried on or bought any of the Charge running shoes, it’s going to feel a lot like that. In fact, the construction of the upper is pretty similar to the original Charge runner. The bootie is well-padded across the top of the foot and around the collar/heel area, making for a comfortable initial fit. The shoe feels a lot like a trainer when you put on for the first time. When laced up, the synthetic piece that wraps most of the upper provides decent lockdown but I still found some slippage. 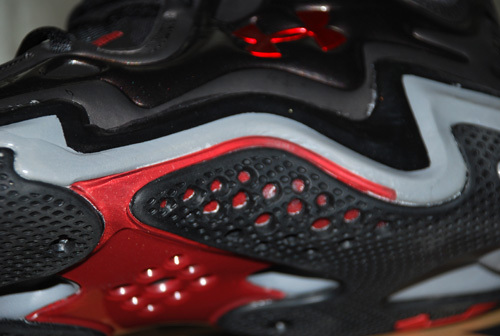 It was especially noticeable in the heel area, where you won’t find a sturdy heel counter like the Spawn had. 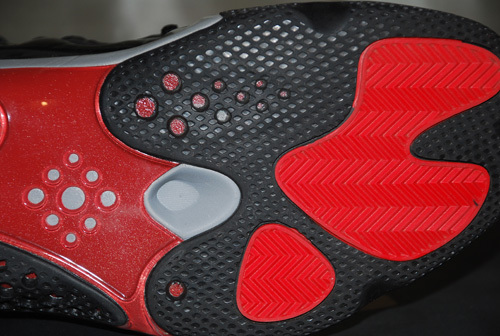 The midsole does wrap up around the heel nicely, mitigating the slippage on the interior to a certain extent. On hard cuts or moving laterally on the defensive end, there’s some movement all over the shoe. Part of that can be attributed to the wider base and my foot shape, but it’s just difficult to get a completely secure fit with the way the Charge Volt is constructed. The eyelet closest to the toe and then the 3rd eyelet up are stitched directly to the inner bootie. This feels like a snug fit because you can feel it pull the material tighter, but the bootie is so stretchy that it loses its support on any kind of movement made at moderate speed. The synthetic overlay makes for a comfortable and unique construction, but simply doesn’t provide enough support. Overall the fit is decent (this will become a common theme) but it’s nowhere near as secure as other lows I’ve tested. The transition through the footstrike might be the most disappointing area of the Charge Volt Low. When you wear a shoe on court, it should feel like one smooth motion from heel to toe when you take a step. With the Charge Volt Low, there is a distinct heel strike and then toe strike – a two-piece movement that you can both hear and feel. In my opinion, this is due to the large TPU shank that gives you fantastic support, but makes for a firm and clunky heel-toe transition. It also simply felt heavier on court overall due to the poor transition. Micro G might be the best on-court foam compound on the market today (we’ll see how adidas’ Boost challenges this later this year) and it’s the one constant that makes the Charge Volt Low a viable option. Court feel is excellent and stability is pretty great too. 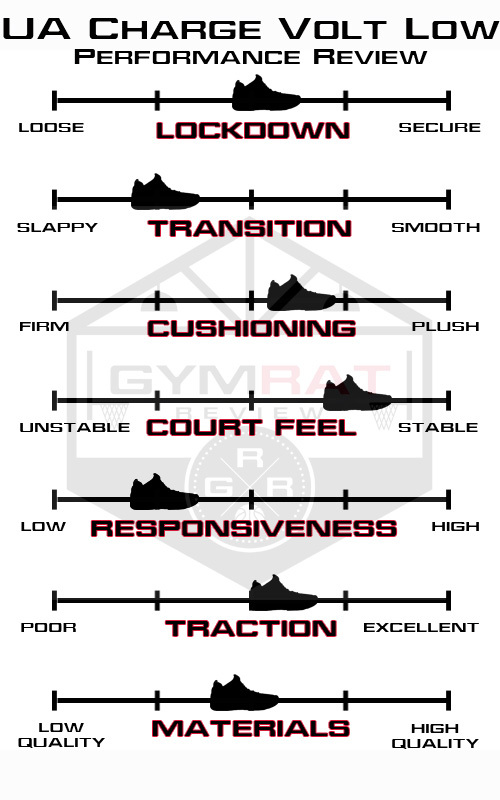 If you value court feel and stability, you’ll love the wide base and low to the ground midsole. This is especially important in a low top, because there’s less shoe to give you support in the event of an ankle rollover. Ankle support comes from the heel fit and stability (the heel fit is a little sloppy) but the Charge Volt Low inspires confidence because of the low and wide midsole. Responsiveness is another issue. Normally, Micro G is a very responsive cushioning system – I threw on my Anatomix to hoop in outside and was amazed at how bouncy they felt even on concrete. 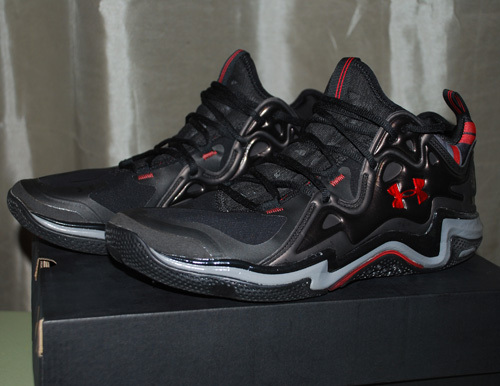 I played in the Anatomix pretty consistently for several months in between other reviews, and they still felt great. Because of the large TPU shank and two-piece footstrike, I think some of Micro G’s responsiveness is sapped. Rather than rolling smoothly from heel to toe and pushing off the foam with each step, the foam spends a lot more time absorbing the harsher impact of the toe strike rather than helping propel you forward. Obviously no cushioning setup is going to really “propel” you, but the best technologies make it more effortless to move in. The Charge Volt Low features a few small herringbone pods, but is primarily a dimpled, harder rubber outsole. The traction is below average on a court with any kind of dust because there’s too much surface area touching the floor on the dimpled portions. The grooves aren’t especially deep, and neither area the pseudo flex grooves. On good floors, the traction markedly improves but is nothing special. The lesson, as always: more herringbone. I feel like some players will be concerned especially with the toebox area, constructed entirely of the HeatGear bootie with some toe overlays fused on. After repeated use, I could see how a heavier player or an explosive type of slasher getting a blowout on the side of the foot simply from the lack of support/containment. I’m always a little leery of the bootie construction in areas where you need a lot of lateral support. Micro G will hold up well underfoot and the general construction isn’t bad. 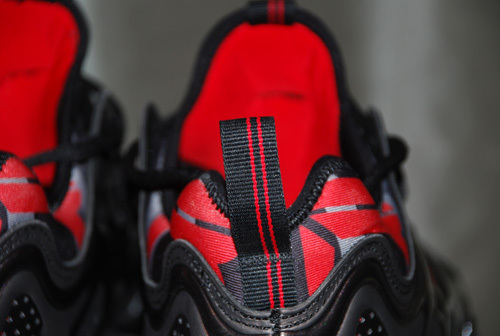 The synthetic piece is stitched on fairly heavily and the padding on the interior of the shoe is awesome. In my personal opinion, the shiny synthetic looks a little plastic-y on the colorway I have – though I can’t speak for all over the models. This turned into a pretty intensive review because a lot of pieces of this shoe required some explanation. There was good and bad with every aspect, and it led to a fairly mediocre on-court shoe overall. If you value support and have a wider foot, definitely add these to your list of options. I think for a guard/wing and a wide-footer, you’d like the way the shoe fits. Unfortunately, the sloppy fit of the upper, below average traction and clunky transition really drags the shoe down. It’s not a bad shoe, and once it hits the outlets or the deep clearance rack go ahead and try them out. Just don’t make them your first option unless you need a wide shoe. In addition, the fact that it’s nearly impossible to try these on in store is enough to make me not recommend them. Let us know what you think in the comments, especially if you’ve seen these in store anywhere. I found them to be fairly narrow (which I liked) but if you have a wider foot I think they might be uncomfortable. 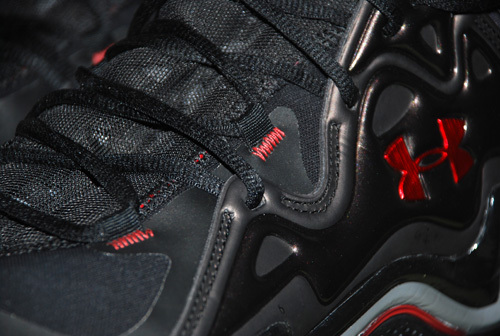 I have read that the newer Anatomix Spawn Anomaly might be a little wider though.